Birder Ray Duffy went to four sites in Secaucus on Thursday — Mill Creek Marsh, Schmidt’s Woods, Laurel Hill County Park and Mill Creek Point. Ray reports: " I found a pectoral sandpiper this afternoon at Mill Creek Marsh, my first for Hudson County. I also saw an indigo bunting. While crossing town to visit Schmidt’s Woods, I stopped at the Huber Street viewing platform for the marsh and found a Savannah Sparrow. "I found four laughing gulls at Laurel Hill County Park with a large flock of seagulls hanging out near the river behind the new Xchange development. "I found a yellow-billed cuckoo at Schmidt’s Woods." Click "Continue reading … " to see Ray’s report. 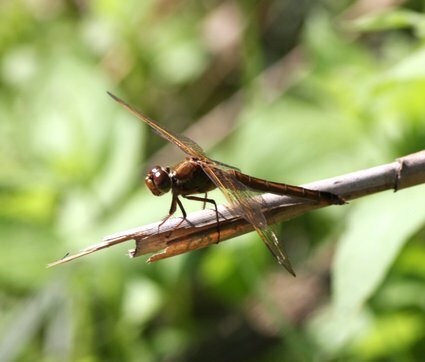 It’s prime time for dragonflies across the meadows… Some by landfills, others by marshes. Click "Continue reading" for more dragonflies.